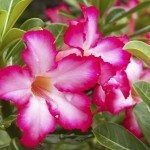 I have a desert rose with no other desert rose around it. About a couple weeks ago, a seed pod started on it. How long does it take for the seed pods to open?